I’ve always believed this philosophy my whole life. And now it belongs in my life more than ever. It takes being on the edge to gain the perspective that you need after a time of crisis. It is a way to reflect back, to see the whole picture, to understand the 360, and to make cognizant choices for how you want your future to play out.. The empowerment of this is wonderful if you let it play out in your life. There are many paths you can take and they are all mapped out in front of you. You can see them all from the edge. The ability to choose your path is yours to take. 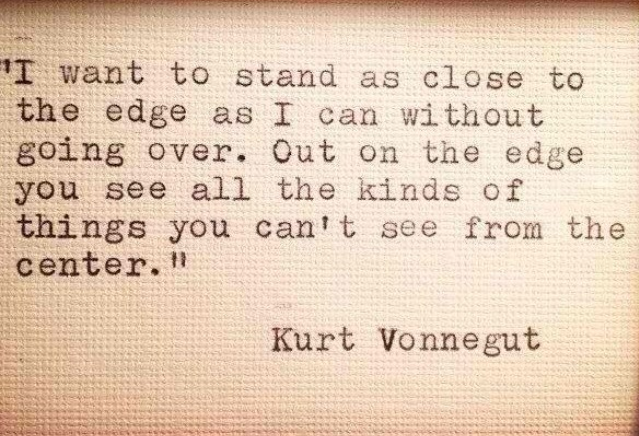 The edge is a gift and it is not a bad place to be. People who have been here on this edge, lived here or camped out, often times gain knowledge and understanding that can cause positive impact for so many if you share it. I am so fortunate to know people out here on this edge and be graced with your presence in my life.. You have my upmost respect..